The American people are the ones who will be affected for generations if Brett Kavanaugh is confirmed. The President and his administration continue to sit under the cloud of serious investigations, which call into question the legitimacy of this very confirmation process. That’s why from the very beginning we have urged the Senate to not proceed with the confirmation process until this cloud has lifted. At the very least we all deserve to know who is being nominated and what his record shows. Ignoring widespread opposition, Senate Judiciary Committee Chairman Charles Grassley recently announced that his committee will begin confirmation hearings for Supreme Court nominee Brett Kavanaugh on September 4. Grassley made this announcement even though large portions of Judge Kavanaugh record — including documents pertaining to Kavanaugh’s tenure at the White House Counsel’s Office during the George W. Bush presidency — have not been released, and even though the National Archives has said it cannot produce the limited number of documents Senator Grassley has agreed to release until at least October. The Supreme Court wields an outsized influence on the lives of every American, and Senator Grassley’s decision to proceed with hearings before Judge Kavanaugh’s record can be fully examined represents a disturbing abdication of Congress’s constitutional responsibility to advise and consent on judicial nominations. The NAACP Legal Defense and Educational Fund, Inc. (LDF) believes that public has every right to a thorough evaluation of a nominee to such a consequential position. That’s why LDF experts have conducted exhaustive analyses of the civil rights record of each nominee to the United States Supreme Court for the last 30 years. 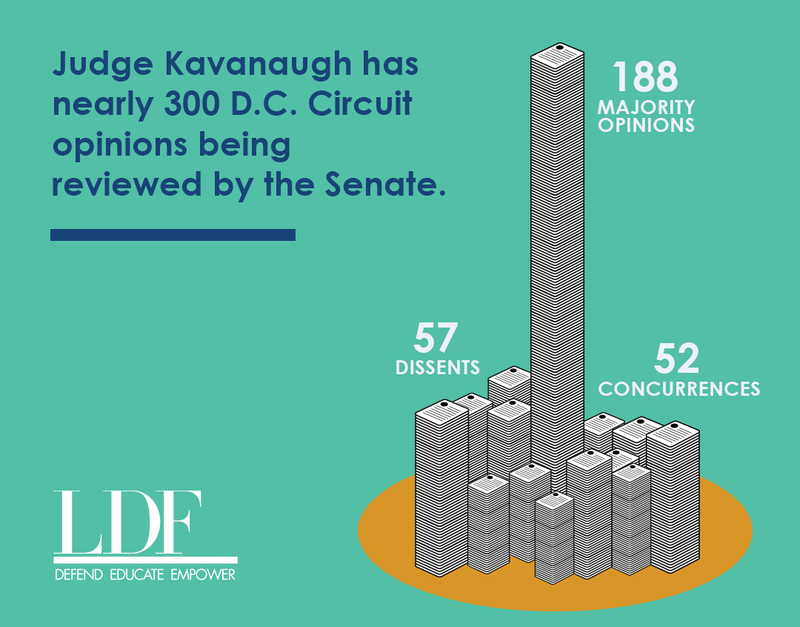 Despite the limited information available about Judge Kavanaugh’s record — and despite a concerted and coordinated effort by Senate Republicans and the Trump Administration to shield that record from public view — LDF once again intends to compile a report for this most recent nominee. Get your comprehensive report delivered straight to your inbox. If you want to know more about Judge Kavanaugh’s record, sign up for our mailing list here. By doing so, you’ll be among the first to review our report, giving you unique insight into Judge Kavanaugh’s record on civil rights. Our report will offer a detailed analysis of Judge Kavanaugh’s publicly available record, evaluating how he is likely to approach cases involving core questions of civil rights and equal justice — questions that are especially important in the context of an administration that has repeatedly shown itself to be hostile to civil rights and the rule of law and when considering a nominee to the court which will likely decide key issues involving the investigations confronting this Administration. We urge all Senators, Republicans and Democrats alike, to press pause on the confirmation at least until Judge Kavanaugh’s full record can be examined. There is far too much at stake — for the Supreme Court, for our democracy, and for our future — to rush this critical process. Sign up and be the first to know when we release our detailed analysis of Judge Kavanaugh’s publicly available record.